Accra (Agenzia Fides) - "The greatest potential threat to social cohesion, democratic governance and national security in Ghana and in many parts of the world is youth unemployment", said His Exc. Philip Naameh, Archbishop of Tamale, during the E-Waste Management workshop, an initiative of the Archdiocese of Ghana to manage the enormous quantity of electronic waste that every year comes from all over the world to the African country. There are more than 215,000 tons of air-conditioners, refrigerators, television sets, washing machines, computers, vacuum cleaners, mobile phones and bulbs, most of which come from Europe. The aim of the initiative is to turn an environmental disaster into a job opportunity for young Ghanians. As Archbishop Naameh observed, "if the collection and processing of E-Waste were properly organised, it would create job opportunities for the youth". 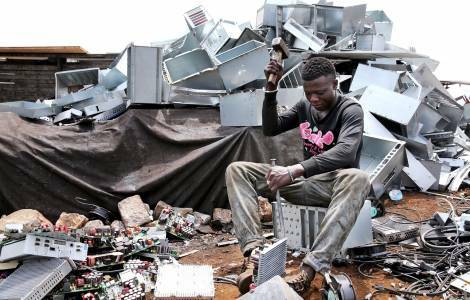 The Archbishop stated that the Church wants to approach this initiative with innovation instead of the traditional model of charity and social services, explaining that the intention is to learn from and integrate business models in the E-Waste management initiative. In this regard, he said the Church is looking for partnerships that would provide investment capital for a Business Plan, not for the sake of profits and interest but for sustainability. Samuel Zan Akologo, Executive Director of Caritas Ghana stated that the workshop marks the beginning of the expansion of the Caritas E-Waste Project outside Accra, adding that the focus this time will not only be on collecting E-Waste but also setting up a dismantling facility which would offer job opportunities for the youth.